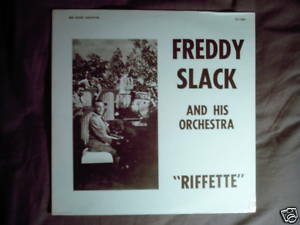 Big Band Archives LP-1202 vinyl LP (issued 1970s, recordings made 1942-1947) Freddy Slack and His Orchestra Riffette (title)/Strange Cargo/The Thrill Is Gone/Kitten On the Keys/Gee Chi My Love Song/He's My Guy/St. Louis Blues/Furlough Fling//Southpaw Serenade/A Kiss Goodnight/Cuban Sugar Mill/Steal Away Easy, Baby/Doll Dance/Chopsticks Boogie/A Small Batch of Nod/Bashful Baby Blues T-Bone Walker is guitarist on five tracks, Ella Mae Morse sings on two tracks; also appearing: Manny Klein, Les Baxter, Barney Bigard, Neely Plumb, Benny Carter, Vido Musso... Still sealed.